The University of Washington is preparing to rework student housing on the north end of campus, replacing two old dorms with five new ones. Two 1960s-era dorms on the northeast side of the University of Washington’s Seattle campus have a date with a wrecking crew, and five new residence halls are planned to take their place. The first phase of the project to remake north campus dorms starts in another month, when McCarty Hall — which has been vacant since last fall — will be torn down. It will be replaced with three new residence halls that will open to students in fall 2018. The project was given the green light last week by the UW Board of Regents. The regents also approved a proposal to begin design work on a 500-bed residence hall at the University of Washington Bothell. The first phase of the Seattle project will cost $240 million and will be financed through bond sales. As with the other new residence halls, the bonds will be paid off through students’ dorm-room rents. The second phase of the project, which is expected to be approved at a later date and cost about $140 million, will include the demolition of Haggett Hall and construction of two more new residence halls, bringing the total to five new halls on the north end of campus housing 2,870 students in all — almost 400 more beds than North Campus had before McCarty closed. Because McCarty and Haggett are more than 50 years old, “renovation is more expensive than redevelopment,” said housing director Pam Schrieber. The fate of McMahon Hall, also on the north end of campus, is under study. It may be remodeled and continue to be used as a residence hall, it may be converted to academic use or it may be demolished to make room for another building. When plans first surfaced to redo North Campus housing — currently the cheapest housing at the UW, about 50 percent less than West Campus dorms — students said they didn’t want to lose the least-expensive rooms on campus. The newest plan calls for a variety of room sizes and designs to make some rents more affordable. 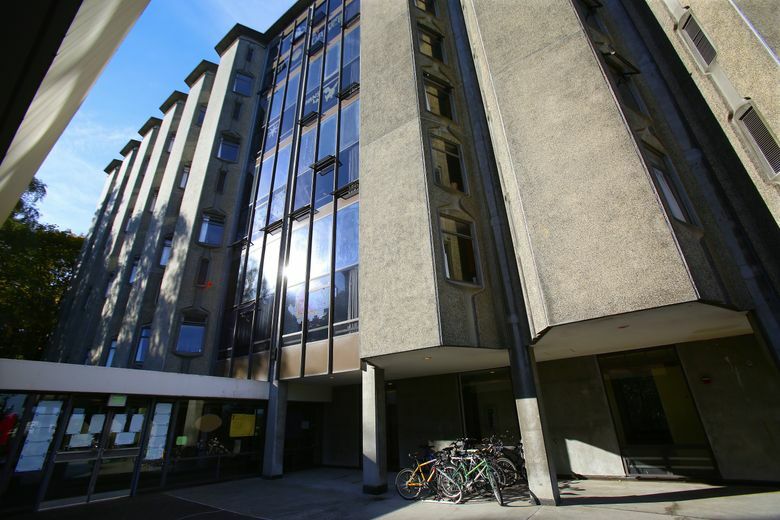 Vanessa Kritzer, the student representative on the Regents board, praised the UW’s housing department for holding meetings with students to listen to their concerns about costs, then redesigning some rooms. The new buildings will include triples (rooms for three students), quads (rooms for four) and double rooms without private bathrooms. Originally, the design called for mostly double rooms with private bathrooms, which are more expensive. Room prices haven’t been set yet, said David Rey, communications manager for Housing and Food Services. It’s estimated that the quad rooms, the least expensive option, will cost $300 less per person, per month than a double room with a private bath. Doubles without private baths will cost $100 less. Two of the new buildings will continue to bear the names McCarty and Haggett: McCarty, for Clara Antoinette McCarty Wilt, the first graduate of the UW and the first woman superintendent of the Pierce County School District; and Haggett, after Arthur Haggett, a former dean of the College of Liberal Arts, and his wife, Winnifred Sunderlin Haggett, former dean of women. The other three buildings will likely be named after trees, Rey said. New halls on West Campus are named Alder, Poplar, Elm and Maple. The demand for on-campus housing exceeded the supply by 31 percent in 2015, UW officials say. More than 10,000 students applied for a room in residence halls, which only have space for 7,673. The university says its housing rates are the third lowest among the Pac-12 schools, and its apartments for single students are generally lower than the Seattle market, averaging $50 to $150 less per month. The University District is likely to be upzoned by the Seattle City Council this fall, opening the door for more high-rise growth in the privately owned neighborhoods adjacent to campus. And the arrival of light rail in the University District — Husky Stadium station opens in March — may make the neighborhood more attractive to people who work downtown or on Capitol Hill, putting a further squeeze on students looking for cheap housing. In Bothell, students at the UW branch campus have long been asking the university to build housing on campus, Chancellor Wolf Yeigh told regents Thursday. The campus leases or owns 277 apartment units adjacent to campus, and the proposal calls for a 500-unit residence hall and dining hall on the north end of campus. A number of Bothell residents have objected to the residence hall, saying the size and scale of the project doesn’t fit the neighborhood. Yeigh said even after the new hall is completed, the branch campus will continue to be primarily a commuter school, with 90 percent of students arriving by bus or car every day.